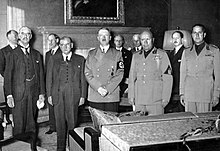 Saint-John Perse attends the negotiations for the Munich Agreement, on 29 September 1938. He stands behind Mussolini, right. ↑ They are some of the intellectual friendships over the course of his lifetime that are attested to by the correspondence published in his Œuvres Complètes.